Hennessey Performance – that purveyor of things silly-powerful – has announced a sequel to its bonkersLotus-based Venom GT, the appropriately sequential Venom GT2. While the performance company isn't quite ready to release full technical details about the new car, it has supplied us with a few of the vitals, as well as a gallery's worth of first-look eye-candy. The GT2 seeks to trump the horsepower output of the Venom GT in a major way, upping the total pony count to 1,500 versus the older car's paltry 1,200 hp. That heroic output is produced by a 7.0-litre twin-turbo V8 engine, and is attainable running plebian E85 pump gas – like a boss. The 1,500-hp figure is significant, too, as it represents one horsepower for each kilogram of weight the car carries. Other additions for the Venom GT2 include an available seven-speed "paddle shift transmission" of unknown origin, a bump in headroom thanks to the double-bubble roof and aero improvements that drop the CofD from 0.44 to 0.42. 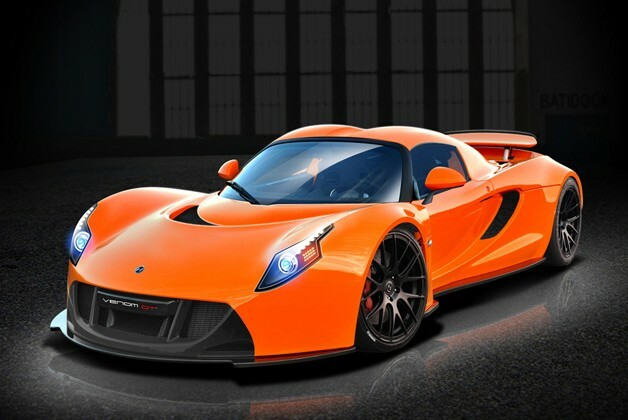 Look for this unmitigated beast of a hypercar to make its official debut late in 2013.